Understanding what makes a self-service solution successful is an important step when considering interactive kiosk design for your business. From the software and hardware to the display, content features, security needs, and beyond, here are 10 considerations to ensure customer-centric kiosk design. The right software design is crucial to a successful interactive kiosk as it determines everything from security to monitoring to integration – and ultimately, to the user experience. Software must enable integration of multiple peripheral components, customize security, and monitor devices remotely. 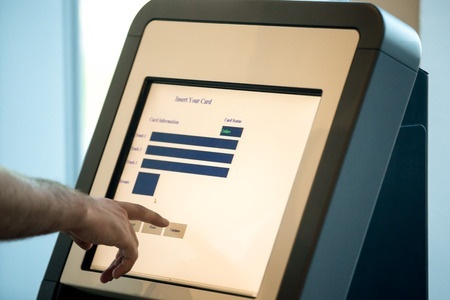 Interactive kiosks located in public spaces require tamper-resistant and ruggedized features that ensure that the physical and data network components of the kiosk are protected from tampering. Industry standard's such as The International Standards Organization (ISO) and Underwriters Laboratories (UL) are other quality safety regulations to consider. Environmental factors must also be considered. This includes properly sealing against water, smoke, and dust - this is critical along with proper UV protection for screens and other components of the kiosk. Temperature control and mounting hardware must also be taken into consideration for guarding against external damage. Considerations on whether the Kiosk will integrate tablets as the user interface will include form factor and size as smaller tablets are not as user-friendly as larger devices. Other considerations may include touchscreen adaptation for readability in direct sunlight. While the messages, instructions, and branding are key, other content considerations include everything from graphics and fonts to colors and images. Text should be legible up close and from a distance. If the Kiosk has any moving text or images with slideshow type screens, take into account the scrolling speed - it must be not too fast or too slow. Kiosk capabilities will vary on intended use and audience, but generally, you may need to consider what your overall use case will be. Some use cases may be an in-store survey that can be collected for in-store insights. This information can enable targeted consumer content, updates, branding changes, and much more. Another capability might be a wayfinding solution for users that includes videos, photos, texts, and/or audio. Other capabilities might include self-service order entry, bill payment or self-service solutions for transactions. Depending on use and location, WiFi, as well as web-based or local application capabilities, may be considered. User experience, (UX) design, is a critical part of a customer-centric kiosk design. Everything from the content and features, to how and where the user interacts with the kiosk is important for an integrated UX design. The kiosk should provide a rich tool-based environment which enables users to easily navigate and consume content. A custom kiosk will require a highly responsive design that utilizes a high-spec user interface that makes navigation simple and intuitive. A proper software platform can integrate with hundreds of optional components to enhance the interactive kiosk use cases – bill payment, patient/visitor check-in, print-on-demand, self-ordering, etc. A platform should integrate multiple devices depending on user needs and functionality of the kiosk. An interactive kiosk requires a performance management system, data security, and a wide range of component support to protect user information. The security features control how the kiosk is authorizing, collecting, and storing personal identifiable data. With any web access features, it's important to preconfigure URL access including whitelisting/blacklisting websites. Accessibility for general and special needs groups may include meeting ADA compliances for vision and physical limitations. Multi-language capabilities have become a common consideration depending on the location of the kiosk. Remote access is a crucial aspect of most kiosks for content changes and health monitoring of the kiosk operating system and software, along with accompanying hardware, in real time. Access by multiple users must be considered if different parties need to respond to different errors, for example, security vs. content. One of the most important aspects of a kiosk is the ROI they can deliver. Consequently, log, diagnostics and usage information reports are key analytic capability considerations. This data can deliver vital user information such as numbers, duration, and other interaction specifics. This information can be leveraged across the business from IT to marketing, sales and customer service among others. The resulting data can guide future investments, products, services and other fundamental changes for the business that increase market share as well as top and bottom line growth. Ask how EX Squared can automate your business processes with Microsoft Dynamics 365. Contact us for a fast and free consultation.